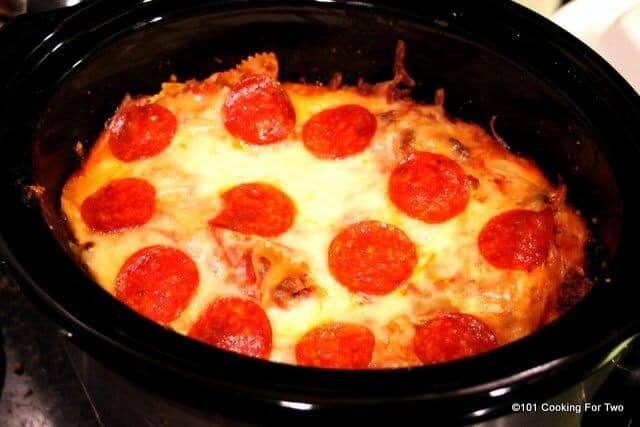 An amazingly easy crock pot pizza casserole to please the entire family. Pizza night has never been so simple. Whip one up tonight. I read a lot of recipes. Most of the recipes called for jar pizza sauce (yuck). This “make it yourself” with the crushed tomatoes and a few spices is so much better. Also, there were lots precooking of the pasta going on. 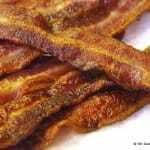 Let’s see, precook and 4-5 hours in a slow cooker will make Ummm …. mush. It is a high 4 for us pizza lovers. But can’t be a five just because there is no crust. Notes: Vary the ingredients to what you like. I like sausage but though that would dominate the flavor. Be careful about adding red pepper or other spicing. The cooking gets the pepperoni spicing distributed and some of it is already spicy. 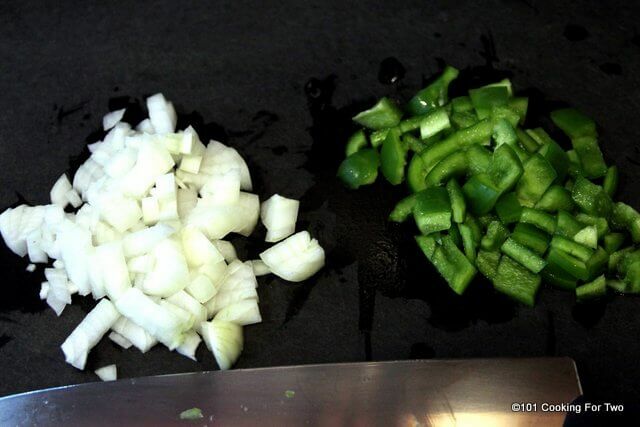 Start by chopping a small onion and half a green pepper. 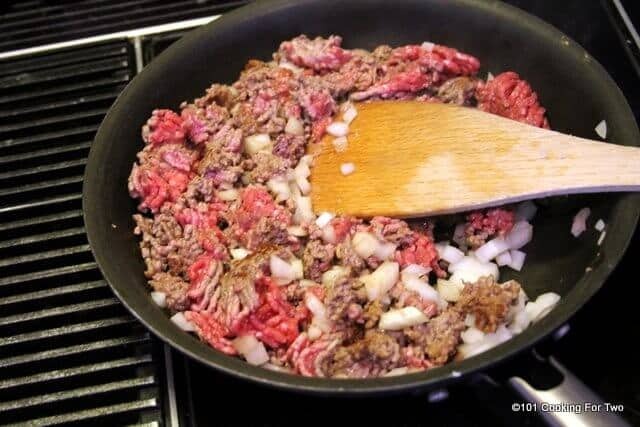 Brown 1 pound of lower fat ground beef over medium high heat. Add one small chopped medium onion after a couple of minutes. Cook for about 8 minutes until no pink left. Add two cloves of crushed garlic the last minute of browning. About 8 minutes total. 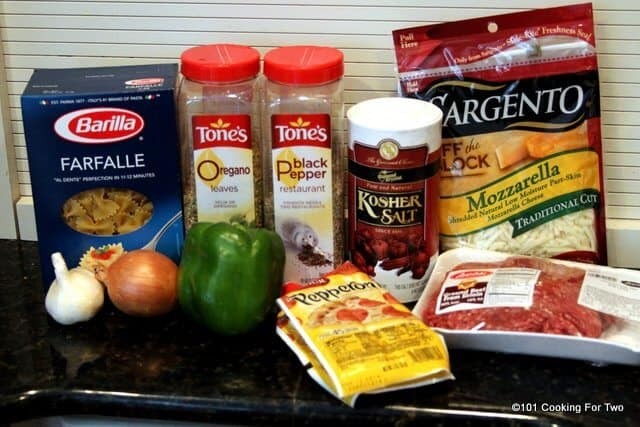 Add 1 – 28 oz can crushed tomatoes, 1 cup water, 4 oz of sliced pepperoni minus 12 slices for topping, two tsp oregano, two tsp salts, one tsp pepper, 1/2 chopped green pepper, 1 cup mozzarella cheese to a smaller crock pot. I used 3 1/2 qt. Mix well. Add 2 cups uncooked pasta. Mix well. Helpful hint: separate the pepperoni as it goes in. 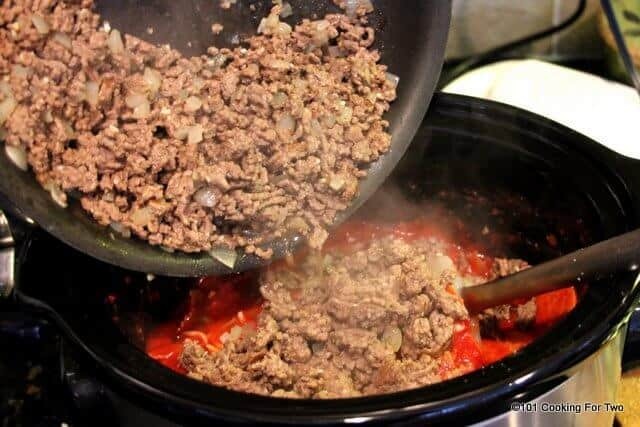 Add the cooked ground beef after draining fat. 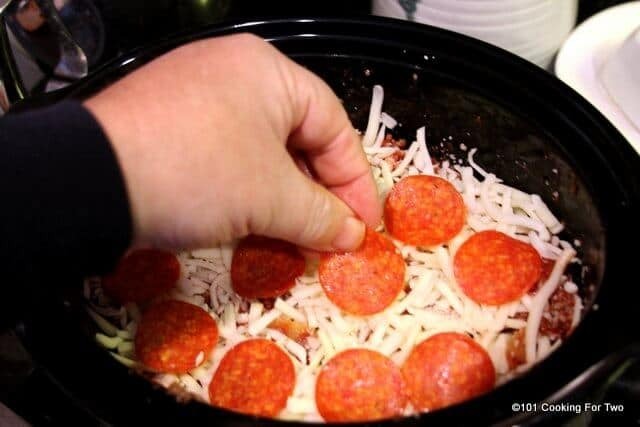 Top with 1 cup mozzarella and the 12 slices of pepperoni. Cook on low for approximately 5 hours until edges browning nicely. 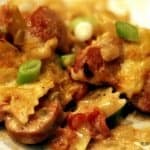 An amazingly easy crock pot casserole to please the entire family. Pizza night has never been so simple. Whip one up tonight. Brown 1 pound of lower fat ground beef over medium high heat. Add one small chopped medium onion after a couple of minutes Cook for about 8 minutes until no pink left. Add two cloves of crushed garlic the last minute of browning. About 8 minutes total. 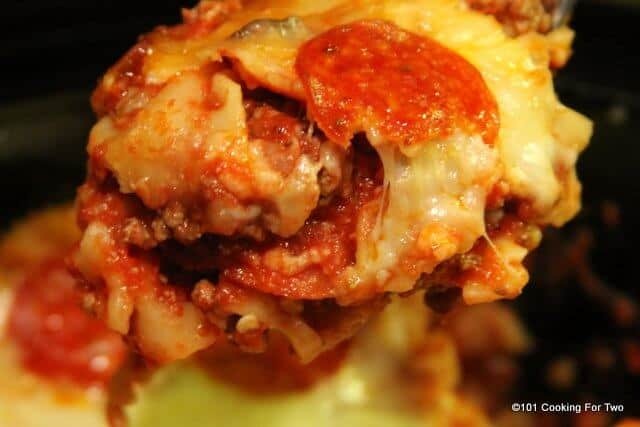 Add 1 – 28 oz can crushed tomatoes, 1 cup water, 4 oz of sliced pepperoni minus 12 slices for topping, two tsp oregano, two tsp salt, one tsp pepper, 1/2 chopped green pepper, 1 cup mozzarella cheese to a smaller crock pot. I used 3 1/2 qt. Mix well. 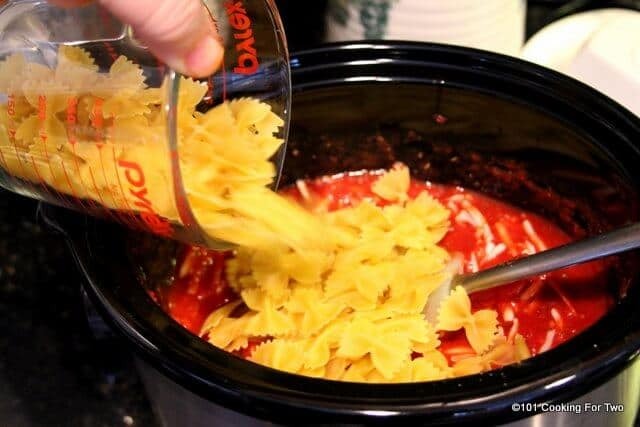 Add 2 cups uncooked pasta. Mix well. Helpful hint: separate the pepperoni as it goes in. Welcome to the blog and sorry for the delayed response. I do love this recipe. Glad you enjoyed the sauce. This was amazing! Now, I did use Mid’s True Sicilian Pasta Sauce Pizza Sauce from Kroger. Grabbed 2 – 16 OZ jars and added 2/3 a cup of water. I used that instead of the crushed tomatoes, salt, pepper, and oregano mix. Also, I added mushrooms and pineapple (my fiancé’s and my favorite pizza toppings). 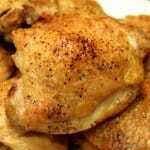 We used a 7 qt crock pot on low for 3.5 hours. Thank you, so much for keeping up this blog and sharing. 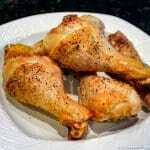 Thank you for this site – I’ve tried several recipes, and all have turned out nicely. Get the extra cheese on now… You want the edge to cook and brown nicely. About the measuring / weight issue. 1 cup volume wise is 8 oz of water. Most liquids likewise weigh and measure about this way (oil not quit). Most home cooks do not have accurate weight measurement available so I measure things like flour, sugars etc by volume mostly. I those cases I state for example 1 cup of flour. When something is measured by a manufacturer like pepperoni if it is 8 oz package and I want half I will state 4 oz. With cheese I try to use volume. I will try to pay more attention in future posts to this issue and it appears that some will try measuring differently I will try to include both. I did add another layer of the toppings at the last bit of cooking, and ate it before I saw your response. Next time, I’ll save back all of the reserved toppings for the last 30-60 or so. Regardless, it turned out very nicely. Regarding the cheese. Normallly for any ingredient, weight and liquid can *almost* substitute. 8 oz of wet is *nearly* 8 oz of dry/weight measure. For shredded cheese, however… 8 ounces (weight) in the block = 16/2 cups dry after shredding. or even 24/3cups if you use a different grater. Unless you pack it – and how hard you pack it. I was on line when your first comment came through but wasn’t fast enough. The longer the topping is on and cooking the more browning and more “pizza like” it will be. More cheese is always good. 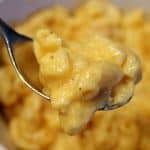 I can’t let my wife help cook when cheese is involved. She won’t measure and it ruins the post… and then she yells at me. When you say smaller crockpot, about what size do you mean? I used a 3.5 qt. but larger should work but add more cheese to the top. This turned out great. I was worried we wouldn’t like it since it isn’t really “pizza”, but it certainly held its own. Felt like I was living on the edge with the uncooked pasta, but it was the right choice. I added some parmesan to the mix and to the top… also a good choice. Thanks for the recipe. So glad it worked for you. I’m a “pizza guy” and find this amazingly good. I was quit surprised the first time…Nice modifications. Thanks again for the comment and rating. 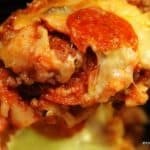 Tried the pizza cassarole in the crockpot and loved it! We made it to take to a friend who is a fiend for pizza, but wanted something “more” than just pizza. We will definitely make this again and again. So delicious and hearty. Just want to tell you I love your new blog! I follow you pretty much everyday because I live alone and many of your recipes are perfect for one or two people’s servings! It’s a bit difficult to just cook really good food for just one after being used to cooking for a family of five, so I really enjoy your recipe ideas! Thanks much for some really great ideas and some really yummy food!! !